Virtual Ability: Humpday Hint: How Sharp is Your Hearing? As Sharp as Your Mind? Humpday Hint: How Sharp is Your Hearing? As Sharp as Your Mind? Maybe you think that hearing loss is inevitable with aging. Did you know that maintaining your hearing as you age can protect your brain health? Older adults with good hearing were found to be more mentally fit than older adults with hearing loss in research conducted around the world 1. However, the causal link between hearing loss and dementia is not yet understood 2. In terms of quality of life, older adults who sought treatment for hearing loss had a higher level of satisfaction than those who did not 3. This may be due to improved social and emotional functioning and communication capabilities 4. There is little to be risked by getting assessed for age-related hearing loss, and treating it has definite health benefits 5. Davies, H. R., Cadar, D., Herbert, A., Orwell, M. & Steptoe, A. (2017). Hearing impairment and incident dementia: Findings from the English Longitudinal Study of Ageing. Journal of the American Geriatrics Society, prepub; Deal, J. A., Betz, J., Yaffe, K., Harris, T., Purchase-Helzner, E., Satterfield, S., et al. (2017). Hearing impairment and incident dementia and cognitive decline in older adults: The Health ABC Study. The Journals of Gerontology. Series A, Biological sciences and medical sciences, 72(5), 703-709; Heywood, R., Gao, Q., Nyunt, M. S. Z., Feng, L., Chong, M. S., Lim, W. S., et al. (2017). Hearing loss and risk of mild cognitive impairment and dementia: Findings from the Singapore Longitudinal Ageing Study. Dementia and Geriatric Cognitive Disorders, 43(5-6), 259-268. Lin, V. Y. W. & Black, S. E. (2017). Linking deafness and dementia: Challenges and opportunities. Otology & Neurotology, 38(8), e237-e239. Manrique-Huarte, R., Calavia, D., Huarte Irujo, A., Giron, L. & Manrique-Rodriguez, M. (2016). 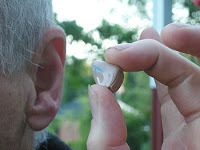 Treatment for hearing loss among the elderly: Auditory outcomes and impact on Quality of Life. Audiology & Neuro-otology, 21 Suppl 1, 29-35; Yamada, Y., Svejdikova, B. & Kisvetrova, H. (2017). Improvement of older-person-specific QOL after hearing aid fitting and its relation to social interaction. Journal of communication disorders, 67, 14-21. Fortunate, S., Forli, F., Guglielmo, V., De Corso, E., Paludetti, G., Berrettini, S., et al. (2016). A review of new insights on the association between hearing loss and cognitive decline in ageing (in Italian). Acta Otorhinolaryngologica Italica, 36(3), 155-166. Golub, J. S. (2017). Brain changes associated with age-related hearing loss. Current Opinion in Otolaryngology & Head & Neck Surgery, prepub.